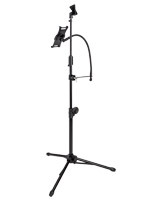 Adjustable height between 28” and 57” for use in both sitting and standing positions. Bracket tilts 180° for optimal viewing angles. 360° Enclosure rotation for tablet movement on a stationary base. Vertical and horizontal orientation for alternate perspectives. 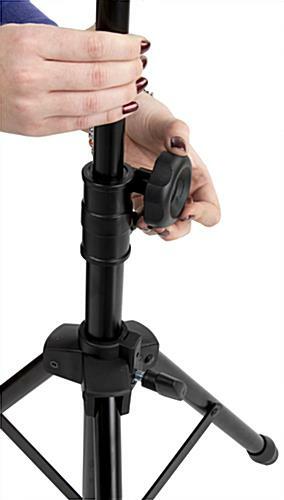 Tripod base for stability and easy collapsing for travel. Includes carrying case for easy portability. Accommodate a variety of iPad models and most 7”-10” tablets. 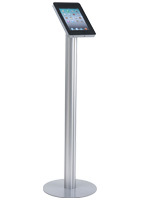 This iPad tripod stand provides owners with a mobile fixture for tablets. Weighing only 4lbs, this Apple® tablet holder is great for those with an on-the-go lifestyle who regularly use digital notebooks. No need to leave a handheld PC at home, this iPad tripod stand that is a portable folding tablet mount makes it easy to travel with technology! This media holder quickly and easily folds flat with the twist of a few knobs. This folding iPad tripod stand is sold with a black zip up duffle bag and strap to haul over the shoulder when it’s time to hightail it to the next location. Photographers, videographers, musicians, and the like, all appreciate the features this tablet mounting easel emphasizes! 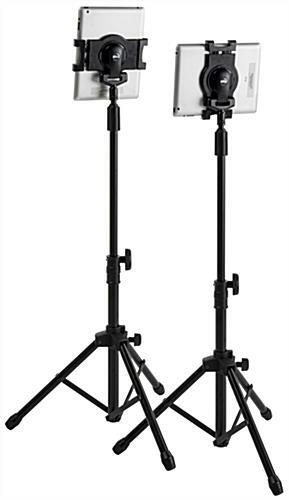 Unlike other models, this iPad tripod stand that has a portable carrying case keeps digital media devices secure on the 3-legged base for a trustworthy accessory while staging a presentation, using it as a camera, recording a video, reading music, or for whatever purpose! This light and adjustable display is a go-to fixture for dynamic lifestyles. 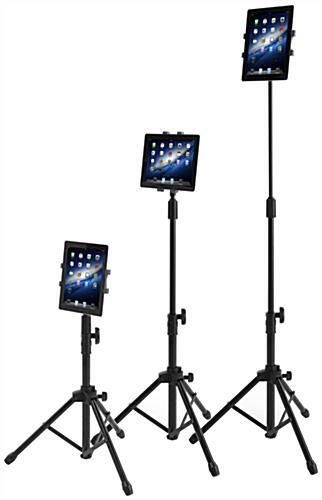 Each black iPad tripod stand is completely modifiable. 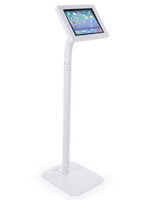 This Apple® tablet holder can tilt 180° and rotate 360° for a wide range of variability in angles and viewpoints. 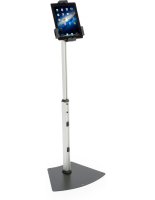 This adjustable tablet holder, iPad tripod stand can be modified in height between 28” and 57”. There are three points at which this portable folding holder can be modified. Unscrew the bottom-most bolt to adjust the legs of the base, the middle for the first height at a maximum of 43”, and the top rotor for a height up to 57”. 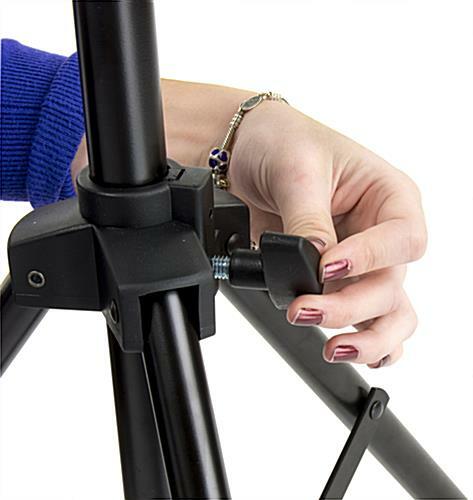 This iPad tripod stand that is an adjustable holder can also transition between portrait and landscape orientation by jostling the enclosure left or right. Each holder is a versatile fixture that allows owners to revel in all of the elements of digital notebook software. The iPad tripod stand, such as a mobile camera mount, is great for traveling to take photos and videos. Various possibilities that are provided by this Apple® tablet mount allow a full range of performance for users! 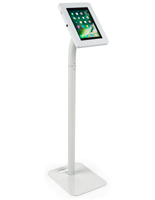 This kiosk accommodates most 7”-10” tablets including several different iPad models. 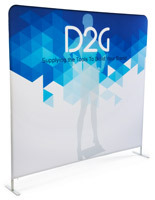 Shop for a portable display today! 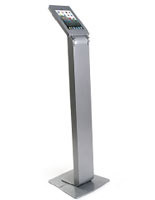 We have been using this iPad stand at career fairs for over two years. They easily and securely hold the iPad in place. Set up and take down are easy and intuitive. Would definitely purchase again! Thanks so much for the great review, Jane! It's wonderful to hear that they've held up for you! This is the perfect iPad stand on the market. 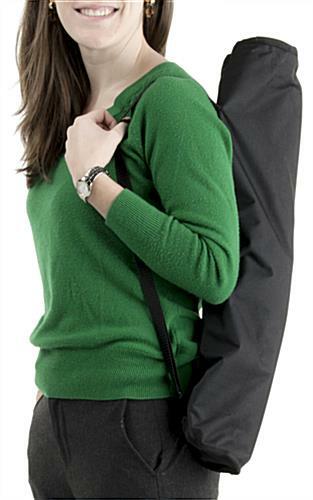 It's light, stable, works as advertise and folds up into a carrying bag. A very well made and workable product. We're so glad to hear this iPad stand worked out so well for you, Carmen! Thanks so much for shopping with us. We have used a few different iPad stands in the past, but this one is one of our favorites! It has lots of different ways to adjust it and packs up very nicely into a great little travel bag! We're so glad to hear this iPad stand works so well for you, Megan! Thanks so much for shopping with us and taking the time to review. We're so glad to hear it, Cory! Thanks so much for shopping with us! This has worked wonders for our iPad when we do video calls! Great for maneuverability when dealing with cords as well.